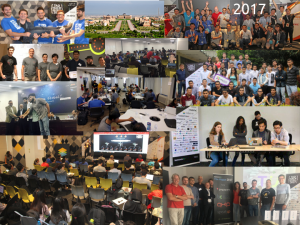 Thank you to everyone who took part in TADHack Global 2017! Especially the 65+ partners and 5 global sponsors: Apifonica, Matrix, Telestax, Temasys, and Vidyo. You made possible the largest global hackathon over one weekend, well two this year. TADHack has grown yet again, with over 3300 registrations, quite a few locations had close to 300, and of course TADHack Sri Lanka leads the pack. We had close to 150 hacks created over this weekend. Some of the significant trends this year include: a big jump in quality of the hacks; a focus on solving real-world human problems across health, security and humanitarian issues; and a focus on scaling the hacks for deployment. Many of the teams from TADHack are planning to take their hacks forward into the real world with the global sponsors’ support. As the global sponsors stated when they announced all the global winners they want to help all the hacks built on their platforms become vibrant businesses. TADS Slack is the platform we use for TADMentor where you can ask for help and advice on bringing your idea to market. Covered in this weblog are the TADHack global winners, the ArcFire challenge winners, as well as a quick review of all the location winners. The locations running on 23 – 24 September were: Auckland, Brisbane, Melbourne, Sydney, Islamabad its satellite Karachi, Kuala Lumpur, Kyiv, The Hague, Lagos, St Petersburg, Chicago, and Buenos Aires. A summary of the winners from weekend 1 are here. With deeper dive weblogs on the Australia and New Zealand locations and Chicago location. The locations running on 29 Sept – 1 Oct were: Sri Lanka, Pune, Athens, London, Lusaka, Madrid (29/30 Sept), Paris, Popayán, and Singapore. A summary of the winners from weekend 2 are here. With a deeper dive into the London location. All the hacks can be viewed on the TADHack YouTube channel. We’ll have lots of weblogs in the coming months on the hacks created, and updates on their progress as they become real businesses through next year. Please provide feedback on how we can make TADHack better in the comments to this weblog, or on TADS Slack #TADHack channel, or just DM me on Twitter, Slack, email, etc. We have lots of exciting plans coming up for 2018, its going to be fun!